I realized the other day that I hadn’t done an EDC post yet, so here it is! I do split EDC, meaning that some stuff I carry on my person but most of it I carry in my bag. There are two reasons for this, one I sit at a computer all day and do not like to have my pockets filled with stuff. I only wear cargo style pants so I always have plenty of pockets to drop things into as needed, but I don’t like to sit at my desk with anything in them. 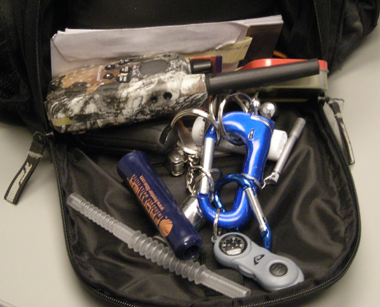 Secondly, as a geek I carry my computer EVERYWHERE I go and I carry it in my EDC bag. 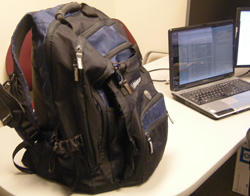 If you ever see the bag pictured on the right, it is probably following me like a monkey on my back. Camera Bag - obviously I was using the camera to take the pictures but I keep it in that bag along with some spare batteries and a couple memory cards. I find it invaluable to always have a camera with me. The one I carry is a Nikon CoolPix P50. Advil - I always have a bottle of advil in my bag, my glovebox, in my drawer at work, on my dresser at home…. I hate getting headaches! U.S. Constitution - It’s covered by the altoids box but I keep this booklet with the Constitution and Declaration of Independence in my bag. Altoids Tin - this is actually filled with several Vaseline soaked Cotton Balls to use as fire starters if needed. 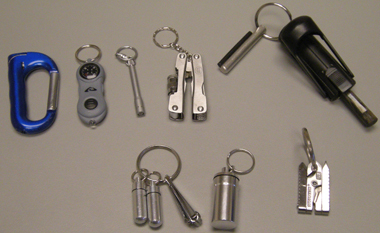 Pill Fobs/Fingernail clippers - one Fob has advil in it, the other has a much stronger painkiller. 8 gig USB drive - for a geek you never know when you’re going to need file transfer capability! I also keep several important docs and files on this drive. That’s pretty much it. 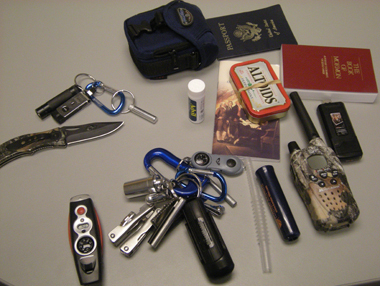 I consider my EDC to be an extended part of multiple prep packs that I keep - my BOB, my vehicle emergency kit, my office kit and other general preps. Any ideas on other stuff I should carry with me everyday?